Congratulations to Lily and Aoife in 5th year on winning second place in the PPLI Film Competition. The competition is organised by the Post-Primary Languages Initiative in collaboration with the Ministry of Education of the Spanish Embassy in Dublin, and this year’s theme was ¡Aprende español en Castilla y León! Lily and Aoife made a 2-minute film promoting the region of Castilla y León as the ideal place to learn Spanish. 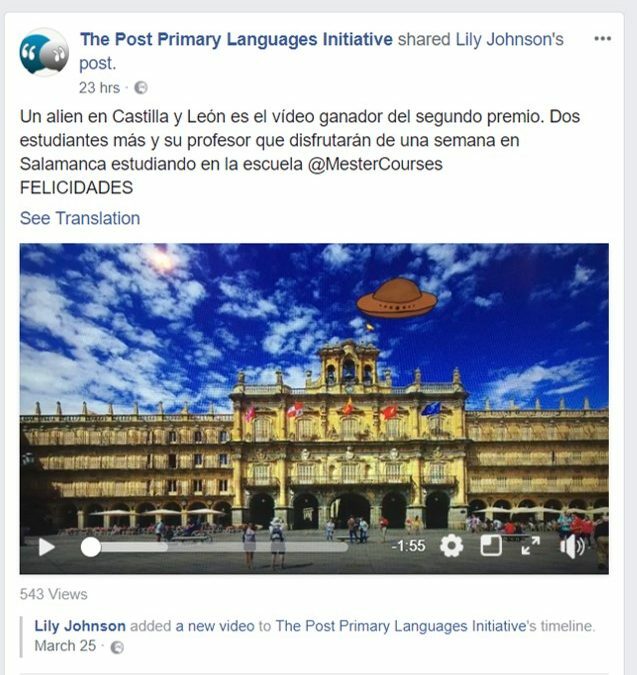 The girls’ imaginative entry featured an alien and the ‘Macarena’ dance, and has won them a week’s language course in the beautiful city of Salamanca. Well done girls!